Our Cudahy car accident lawyers and law firm provide expert personal injury legal services for those injured in auto, motorcycle and other accidents, and for the relatives and families of those killed in car and other accidents for wrongful death claims, in Cudahy, California, a city of 23,805 people, located in Los Angeles County, California. If you had a car accident or other personal injury claim in Cudahy or anywhere else in California, please contact our injury attorneys and legal team now for a completely FREE CONSULTATION. Cudahy is the second smallest city in Los Angeles County, but has one of the highest population densities compared to any other city in the United States. Some of the cities that border Cudahy include South Gate, Bell Gardens, Commerce, Downey and Huntington Park. Obtain the all names and contact information for the driver and owner of each involved vehicle, all witnesses and passengers, and their drivers' license numbers. Read and copy the other person's driver's license information directly from the driver's license; do not rely on them to give you the information as it may be wrong or false. For each vehicle, record the license plate number; vehicle description including make, model, color, anything written on the other vehicle(s) such as company names, telephone numbers, logos or other identifying information; and the location of all property damage (both from this collision and any other damage that looks unrelated and/or pre-existing). If you have a camera handy (remember including in your mobile telephone), please take photos showing this information. If the accident is not your fault, we strongly advise that you to call the police (911) and obtain a police report (aka Traffic collision report) to confirm same. A Cudahy car accident can severely injure people and be extremely traumatizing for the victims involved so it is very important to have an experienced car accident injury lawyer on your side. In our over 40 years of personal injury experience we have successfully resolved thousands and thousands of car injury accident cases and two of our attorneys, Robert Walch and Gary Walch, were each selected as Top Lawyers in California (Highest in Ethical Standards & Professional Excellence). Our aggressive but compassionate attorneys and staff work extremely hard to make the claims process easy for our clients, the victims and their families. 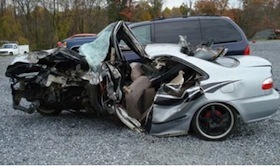 For more information, we invite you to visit our new and updated Car Accident Web Site. An astounding $100,000,000.00 plus in funds has been recovered by The Walch Law Corporation for its clients; and our law firm also offers the victims of car accidents assistance with medical care (regularly without any payment until the case is resolved), specialists, property damage repair and settlement. You can find out more about what our clients have to say about us on our Car Accident Testimonial Pages simply by clicking here. One painful injury, but common injury, that victims of car accidents experience is often called whiplash. Whiplash is a non-medical term describing a range of injuries to the neck caused by or related to a sudden and abnormal motion to the neck. A whiplash injury may be the result of abnormal stretching of the spine, mainly the anterior longitudinal ligament (the ligament that runs down the anterior surface of the spine) which is stretched or tears, as the head snaps backwards and then forward causing a whiplash type injury. These extreme motions push the neck muscles and ligaments beyond their normal range of motion, causing injury. The most common symptoms related to whiplash injury from accidents include neck pain and stiffness, headache, shoulder pain and stiffness, dizziness, fatigue, jaw pain, arm pain, arm numbness and weakness, visual disturbances, ringing in the ears and back pain. If you or someone you care about sustained any neck or other whiplash injury from any car accident or other personal injury accident in Cudahy, Los Angeles or anywhere in California, please contact us now, as well as for referrals to doctors who may offer treatment without expecting any payment until the claim is resolved. The Law Offices of Gary K. Walch provides you the professional support you need while offering you and the expert advocacy that is essential for you to have when you or a loved one has been through a catastrophic car accident or other personal injury accident in Cudahy, Los Angeles or anywhere in California. Our job is to stand for your interests while we personally make it our obligation to protect your rights to the highest standard possible. Our staff handles car and other injury accidents involving motorcycle, truck, bus, train, bicycle, pedestrian, hit and run, uninsured motorist (UM), cars and autos, and much more. Call us for an absolutely FREE consultation to review and analyze your car accident or other personal injury case. For your convenience you don’t even need to leave the comfort of your own home. Just like many of our clients you can do everything by telephone at 818-222-3400 or toll free 866 INJURY 2 (465879 2), email (info@WalchLaw.com) or simply complete our very easy to use contact form.